Power Rangers: Battle for the Grid is a fighting game for console and PC that allows users to compete in team battles against the computer or other players in a variety of game modes. Players can choose from nine characters pulled from the Power Rangers’ 26-year history, including Jason Lee Scott and Tommy Oliver (Rangers from the first series, Mighty Morphin Power Rangers), Goldar (a villain from the Mighty Morphin Power Rangers series), and Lord Drakkon (an evil Ranger first seen in the Power Rangers comics). Each of the game’s modes offers a slightly different experience, based on whether or not players want to battle on their own (against the computer) or against other players, either online or offline. Casual Mode and Ranked Mode let players compete online against other players with similar skills from around the world, while Versus Mode allows them to battle it out against the computer or another player offline. A Training Mode lets players practice against the computer, and an Arcade Mode features a series of battles that culminate in a fight with a final boss. Before heading into battle, players select a team of three characters, allowing them to mix and match heroes and villains to suit their play style. While, generally speaking, only one of the three characters will be active in the battle at any one time, users can switch between their three characters on the fly, and even temporarily bring in multiple characters to perform special Assist moves. Players also have access to special “Ultra” moves, allowing them to call Dino Megazord, Dragonzord, or Mega Goldar into battle. Power Rangers: Battle for the Grid is available to download on Switch and Xbox One for $19.99. The game will launch on PlayStation 4 on April 2, and on PC later this year. 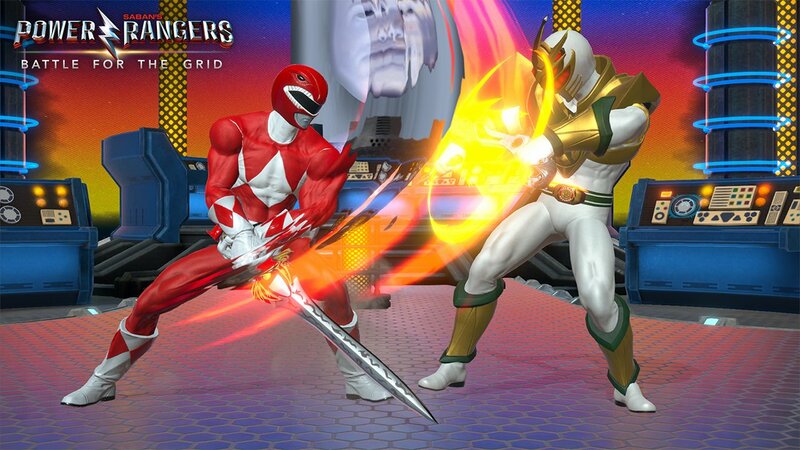 Power Rangers: Battle for the Grid is rated T for Teen by the ESRB. The game contains optional in-game purchases. While the Power Rangers franchise is typically kiddo-friendly, fighting games are fast-paced and have lots of controls to remember, so younger players may need help diving into this one. Check out 13 minutes of gameplay from Power Rangers: Battle for the Grid below to see how the game looks in action.